Mizuma Art Gallery is pleased to present KUMAZAWA Mikiko’s solo exhibition “Coming and Going”, opening on Wednesday 1st November. Kumazawa is known for her depictions of the world that are at once subtle and overwhelming, mainly rendered in pencil. In her previous solo exhibition “Howl” (2015) the artist presented the largest work of her career to date, “Tree of Ogre’s Children”, which left an intensely strong impression upon viewers. Since last year, Kumazawa has been engaged in the new challenge of involving a uniquely distinctive element of colour in her visual expression. The very first work created within this development, “World Food Tour”, won the 9th Suga Tatehiko Grand Prix. 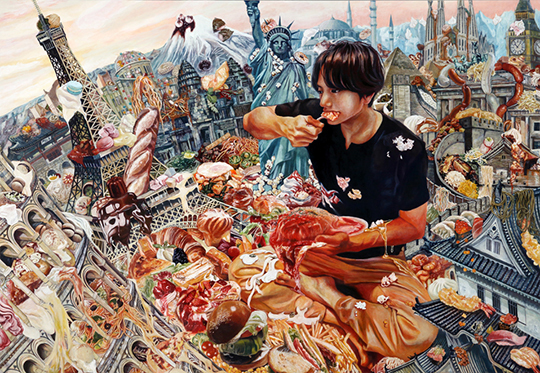 In this exhibition Kumazawa will show three works, including “World Food Tour”, which embrace the new challenge of uniquely expressive colours with a vivid sensibility, as well as various pencil drawings. Sprawling city townscapes, or rampantly growing plants, or a picture plane crammed to the brim with food: Kumazawa depicts scenes in which the everyday world that surrounds us has undergone a transformation. In the midst of these strange environments of continuous propagation and transformation, people appear not to be questioning the situation but instead to calmly accept it. Today, as the sense of both virtual reality and artificial reality’s presence in our lives increases year on year, and as every message we post on social media is recorded as indisputable actuality, there is the sensation of a gap gradually emerging between our experiences of the landscapes of the real and the memories of reality. Given the pan-focus with which Kumazawa’s works are subtly depicted, and her continuously expanding landscapes, perhaps it is precisely their surplus of transformation that makes these compositions in fact a sincere and accurate method of depicting the world of this generation. We look forward to welcoming you to this unique opportunity to experience the work of Kumazawa, invested with new expressive qualities and rendering in subtle complexity the variegated landscapes of everyday life.